If you want to start a garden and don't have suitable soil for growing veggies, try building a raised bed for your plants. 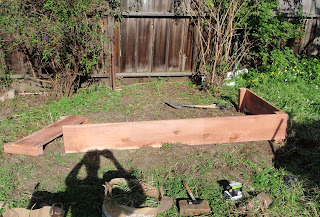 A decent sized raised bed (8x4 ft) will most likely run you about $200, including buying soil/compost and building materials. If you have access to free compost and/or topsoil then you'll need about 50-75 bucks less. It can be a good investment, and the raised bed more than likely won't need replacing for many a year. In addition to high quality soil, it makes tending to weeds a lot easier too. -Use an untreated wood like cedar, so that nasty chemicals don't seep into your veggies. It's true that the untreated wood rots faster, but you still won't need to replace it for years. -You can have the folks at the hardware store cut the wood for you, so you don't need a fancy saw. -The soil you use should be a combination of topsoil and compost. You can also add peat moss or manure to the mix. 1. After you pick a spot for your raised bed, remove any weeds, grass, or debris. Digging with a pick or tilling the area a little to loosen up the soil is helpful for settling in the posts. You can also always use a post-hole digger for extremely hard soil. OR you can use a post with a length the exact width of the board and not worry about the possiblity of shifting. (Also, you'll need to decide whether or not you want your post flushed with the top of the bed, or for it to stick up a little.) As you can see our posts are flushed, and that means no pesky measuring to make sure the tops are the same height. 2. There are two ways to get started. ONE, make your first corner: Nail (or use wood screws) to attach on 4 ft board and one 8 ft board to a post. Now place the start of the structure where you'll want the bed to be permanently. Take a mallet or hammer to pound the post into the ground a little to help stabilize it. 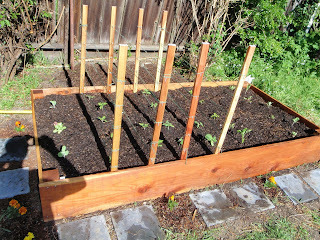 Then, add a new post and begin attaching the rest of the boards. Repeat. 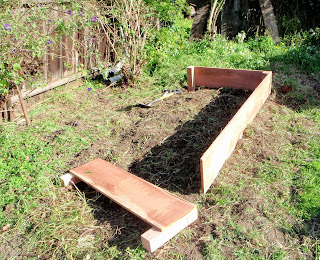 Boom— raised bed. 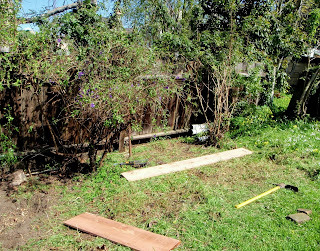 Or TWO, take two posts and attach a 4ft board to them, pound the posts into the dirt in what will be their permanent spot. This works fine if you choose to have longer posts that will stick into the ground. Then attach the longer boards, or one long board and the other completed end (posts plus 4 footer.) Raised bed appears. 3. Before filling your new structure consider putting down a layer of “mulch.” To keep weeds at bay, you can put down a layer of newspaper 3-4 sheets thick before adding the soil/compost. As you're filling the raised bed, it's also a good time to add a fertilizer if you use one. You can find a number of organic fertilizers at your local nursery. 4. Now you're ready to put the plants and seedlings in when they're ready. 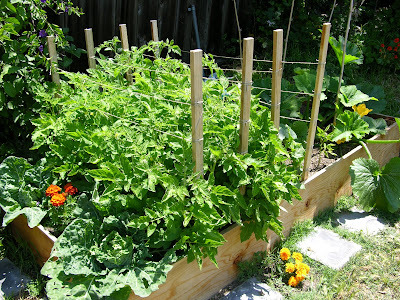 For extra bonus points you can attach stakes to the side of the bed and make a trellis for vining plants like cucumbers, or for supporting your tomatoes.